Hangzhou East Railway Station is one of the largest railway hubs in China. Put into use on 1st July, 2013, it is about 5 miles (8 km) to Hangzhou Railway Station, 5 miles (8 km) from West Lake (Broken Bridge), 13 miles (21 km) to South Railway Station and 17 miles (27 km) to Xiaoshan International Airport. The east train station specializes in high speed trains, including those to/from Beijing, Nanjing, Guangzhou, Changsha, Xiamen, Kunming, Fuzhou and Hong Kong. Hangzhou East Railway Station consists of two squares and a station building. On both squares there are city buses and parking lots for private cars. How to get to East Station from downtown area? Passengers taking the bus to the station arrive at the west or east square, and then take escalators to the waiting hall to find a seat and wait for the departure if a ticket is in hand already. If not, buy a ticket in the ticket office on 1F. Afterwards, go to the waiting hall. Passengers arriving by subway will get off on -2F and exit to -1F of the station building. If arriving by taxi, passengers will be dropped off at elevated drop-off area on 2F right outside the entrances. For overseas passengers who are going to buy/ collect tickets upon arrival, they need to go down to ticket office on 1F. Before checking in, passengers should read their tickets carefully to confirm where they should go to have their tickets checked. After checking in, passengers take escalators to 1F to get onboard. Please note that pink tickets should be handled manually, while blue ones can be checked at automatic ticket checking machines. Please keep your ticket available even after getting onboard successfully, as they will be checked at the exit of the arrival station. Upon arriving, all passengers will be led to transfer hall on -1F to exit. Passengers can follow the direction boards to find buses, taxis or the subway to leave the station according to their routes. Subway entrances are located on -1F. Passengers can find them easily after exiting. Passengers want to leave by bus can take bus at the east or west squares. Passengers can first take escalators to where the buses are located and then leave for their destinations. Taxi stands are available at both east and west sides of the transfer hall. Passengers can take a taxi without getting out of the station building. It is very convenient. Take subway line 1 to get there directly. Upon arrival, get out from exit A2, and walk northward to the destination. Take airport shuttle bus at the east square of the station to Xiaoshan Airport directly. The bus is available from 05:30 to 09:00 every 30 minutes and from 09:00 to 21:00 every 15 minutes. It usually takes 30 minutes and the ticket fare is CNY20 per person. Take subway line 1 and get off at Longxiangqiao Station, exit C4. After, walk to the scenic spot. Take subway line 1 at the station and get off at Longxiangqiao Station, exit B3. Then walk to Dongpo Road Pinghai Road Intersection to take bus no.7 to Lingyin station, and then walk 480 yards southwestward to the temple. Four ticket offices are available, with the biggest one on 1F close to the East Entrance. Waiting hall is located on 2F. Passengers can find a seat in the correct waiting area according to the ticket information to wait for the departure. Hot water and toilets are available around the waiting hall for passengers’ convenience. 28 check points are provided inside the waiting hall and they are symmetrically located on north and south two sides and numbered as 1, 2A, 2B, 3A, 3B… Around the waiting hall, other facilities including books and newspapers stand, restaurants, shopping area as well as barrier-free facilities are available. There are luggage lockers behind the check-in pointes 2A-3A, 8A-9A, 10A-11A, 26A-27A, 2B-3B, 8B-9B, 10B-11B, and 26B-27B in the waiting hall on 2F. The charge is CNY 5 for a small locker and CNY 8 for a large one per 12 hours. At the passenger service center, luggage porters can help to carry luggage to the carriages. Each piece of luggage is charged at CNY 10. Information desk is located in the center of the waiting hall. Passengers can seek advice about ticket refund, ticket loss or search information about schedule, departure time, arrival time or left luggage service and so on. It is easy and very convenient. Just face some communication problem at the ticket paper issuing but finally i got it by helping of a staff who can talk english. By the way, thank you very much for your kindly help about the hotel and answer a lot of questions. It is really usefull for my lovely trip. Thank you for all your assistance on my last trip to China. I really appreciate your helping me and providing valuable assistance. All went very smoothly on the trains (except for the bad weather that delayed my flights), but the trains were great and I was very happy with their comfort and service. Some time ago I booked a train ticket with TravelChinaGuide Tours by internet for my journey from Beijing to Hangzhou on July 13th. This, because I wanted my travel arrangements to be booked and confirmed in advance, so I would not be confronted with any unforeseen ‘surprises’ during my holiday. I must say that the booking process with TravelChinaGuide went without any problem and went in a good and communicative way. The communication and confirmation through e-mail was very clear and good. I also arranged, for a small extra amount, with TravelChinaGuide that my train ticket would be delivered at my Hotel in Beijing. At arrival in my Hotel in Beijing the train ticket already was there and was delivered to me. A great service that also meant that at the train station I could easily and immediately go to the waiting area and train gate, without having to stand in line to collect my ticket. I would advise this service to other foreign visitors. The train journey was very pleasant. I travelled with high speed train in 1st class. You had booked a window seat for me, which was great. The comfort (of the chair) and leg-room was very good and the journey went swift and exactly on schedule. I enjoyed it! Everything went very well. Thank you for the excellent service. Overall I had a wonderful and great experience booking the train tickets with your company. The instructions and guides were very clear and allowed me to have 2 hassle-free train journeys in china. It is advisable to collect all your train tickets beforehand to save you the time of searching for the collection counter in each station. I could read chinese and I spend almost 15-20 mins walking from entrance to entrance looking for the correct counter in Hangzhou East station as foreigners are required to show their passport at a specific(and I mean specific as in only one) collecting counter instead of the ones used by the locals or at the ticket collecting machines. There is no English signage indicating which is the actual ticket collecting counter for passport holders/non-locals , so my best advice for travelers who don't read chinese would be to look for the counter with an almost non-existent queue among the jammed up ticket purchasing counters. This is my personal experience at Hangzhou East Station, it might differ from station to station. For check-in/Waiting/Boarding: There's no indicative time frame for it, but do remember that boarding starts 10 mins before departure time, so it would be advisable to arrive at the station 30 mins beforehand. The 2 stations I was at(Hangzhou East+ Nanjing South) have comfortable and clean waiting areas with a handful of chain restaurants/cafes on the 2nd floor. Again, there's no English signage on the departure board but they do show the departure time, train Number and departure gate. So double check these 3 with your ticket to make sure you're at the right gate. 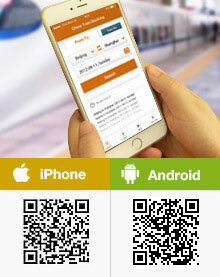 Finally, carriage/Seating: Your train carriage and seating number is indicated on your ticket. Some of the slower trains sells standing tickets, so don't worry if you find that your seat has been taken by one of the passengers, just politely show them your ticket and you will have your seat back. Everything went smoothly, thanks alot ;) one thing i would point out to other travelers is to be mindful when the ticket offices close at individual railway stations. Specifically, we got a bit worried at Hangzhou East Railway station where 2 ticket offices close at 19:00 (we arrived later) but fortunately there was a third one which was still open (but there were no signs pointing towards it, we had to ask the staff). Yes, we enjoyed our trip very much. We didn't have any problem with the train service. It was very easy and convenient for us to book the train tickets through your booking center in advance. The information and instructions provided by you for the collection of tickets, locating the right gate and platform, boarding of train and locating our seats were very helpful. So, thank you once again. It is so easy to travel from city to city by train. We will definitely be using your service again for our future trips. We will also not hesitate to recommend other travelers to use your service. I booked 2 journeys for my family prior to leaving Scotland for a 3 week holiday in China. Both were train journeys. Firstly from Hangzhou to Nanjing and then from Nanjing to Beijing. The process of booking and payment was very straightforward and I was delighted with the assistance received from Travel China and my direct contact Phoebe MaeI. Which square should I use to enter for this train? East or West? It is about 45km. You may consider the taxi or maybe a rail service from Shaoxing North. What is best transportation from Hangzhou East Railway Station to Fengqi metro station? metro line 1, 5 stops, you will get to Fengqi metro station directly. There is no direct subway/metro/rail but you can take airport shuttle bus. The price is around CNY20 per person and take around 30 to 40min on the way usually. You could take airport shuttle from East Railway Station to airport directly, it will take around 50mins - 1 hour, and cost around CNY30.